Charles Darwin University’s Teaching and Learning Development Group (TLDG) have developed a new website to support higher education and VTE staff in their teaching practice. The Teaching 4 Learning (T4L) website provides information, ideas, links and resources to support staff in professional practice. Featured themes include teaching in the CDU context, teaching and learning, e-Learning and professional development. 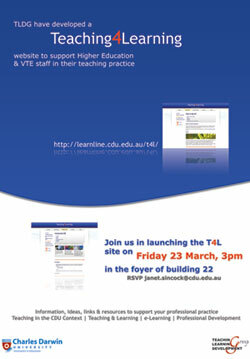 Join TLDG in launching the T4L site on Friday 23 March at 3pm in the foyer of Building 22, Casuarina Campus. RSVP to Janet Sincock for catering purposes, email janet.sincock@cdu.edu.au or phone 8946 7778.